Up to 25% PRICE DROP - PRICE MATCH GUARANTEE On our range of Blue Elasticated Rubber Castors. High performace rubber castors with added durability able to carry loads from 150kgs each to 400kgs each. Non marking quiet running blue rubber castors, choose from 5 wheel diameters.Reduced prices as shown. 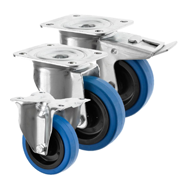 UP TO 25% PRICE DROP - In our 3360 Series Blue Rubber Castors which are our best selling industrial castors with a non marking blue rubber wheel, for medium and heavy duty applications. These popular elasticated rubber castors are often used as flight case castors and available in five sizes from 80mm diameter wheels up to 200mm. Elasticated Blue rubber castors give the smooth rolling of a rubber castor, with added strenth able to carry loads up to 400kgs each. The non marking blue rubber wheels are ideal for quiet movement leaving no marks or scuffs on your floor surface. Also ideal for uneven ground as the blue rubber castors can move efficently whilst absorbing lumps and bumps. You can combine these easy rolling rubber castors as they are available as swivel castors, fixed castors and braked castors.